Right from the beginning, we have been trying our best to serve the common people and the children. In this direction we have published many children's literature and books. We brought out Vedic literature to Stotra literature. However, the scholarly works have not been ignored in our endeavor in preserving the ancient literary treasure. In this journey of literary conservation, it was our long-term wish to publish the Monier Williams dictionary with readable type set. The dictionary was published several times with instant print technique with the same century old type set, which was difficult to read, and was full of obsolete letter style. The present generation finds it difficult even to read and comprehend in spite of all merits the dictionary possesses. Hence, we started composing the dictionary with pleasant and readable type set. In making the dictionary more useful we were searching for a scholar who could spare his time and scholarship in editing the dictionary. With this aim in mind, we approached Prof. Ramanuja DEVANATHAN, presently working as Principal, Rashtriya Sanskrti Santhan (Deemed University), Rajiv Gandhi Campus, Sringeri - 577 139, who has gladly accepted the academic assignment and helped us in editing the dictionary and prepared an exhaustive appendix for practical usage and classified it into several categories. We express our sincere thanks to Prof. Ramanuja Devanathan for his scholarly help in editing the dictionary. Dictionary is an essential tool for any language learner. Sanskrit being the language not spoken as mother tongue, though the recent census gives a statistical figure of few who speak Sanskrit as mother tongue and registered their mother tongue as Sanskrit, certainly necessitates referring dictionary. Further, the language due to its many peculiarities and distinctiveness such as gender, cases etc., distinguishes it from other languages. In ancient India when Sanskrit was the principal language of communication, all the traditional treatises were propounded and propagated through this language. Learning of any language at rudimentary stage undoubtedly requires vocabulary of the language in which higher learning is to be pursued. Hence, keeping the inevitable need of the day for language vocabulary, ancient Sanskrit scholars evolved a system of language dictionary in the form of word compilation right from the Vedas to the modern Sanskrit. Perhaps, the first such dictionary was compiled by Seer Kashyapa. Later, the tradition of compilation went on uninterruptedly and Shaunaka, Yaska and others have compiled dictionaries on Vedic literature. In modern Sanskrit also, Panini and others compiled words of various nature under Ganapatha, Dhatupatha, Unadipatha etc. Afterwards, compilation of words in Sloka form was undertaken by various authors with an aim to easy retention. At present, Amarakosha compiled by Amara Simha is the most appreciated and propagated due to its uniqueness and usefulness. In fact, in ancient days, Sanskrit learning stated from by hearting Amarakosha. 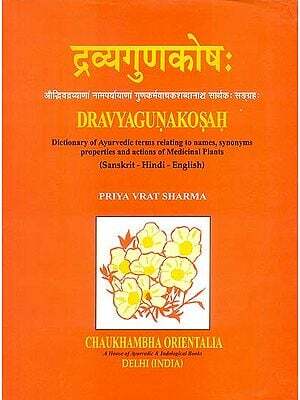 Needless to mention that Shabdakalpadruma of Raja Radhakanta Dev and Vachaspatyam of Taranatha Tarkavachaspati are invaluable and incomparable treatises that belong to Dictionary class, which are not only deal with the meaning but also elaborately present all the related literature in toto. In modern India, the Europeans have understood the importance of Sanskrit as language, culture and emotional tool of integration of the country and paid attention in propagating the language. 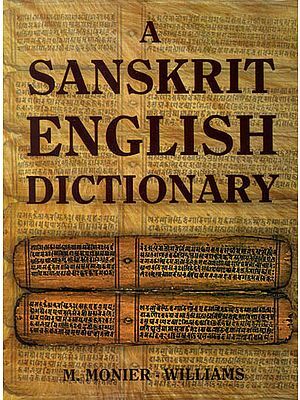 They started compiling dictionaries of Sanskrit to facilitate the foreigners to learn the language with ease. In fact, the credit of compiling dictionaries on modern lines certainly goes to Europeans who during 18th and 19th centuries compiled various vernacular dictionaries with English meaning. This task served two purposes one to learn the language concerned and the second to establish their rule. Among the compilation efforts of Sanskrit words, certainly, the efforts of M. Monier Williams would be remembered always for its merits and usefulness. One could understand the authentic hard work and commitment with which he has compiled the dictionary. Williams took nearly 9 years to complete the work, which is the reason still it reigns the Sanskrit world. Later-compilers have taken help and rather depended on this dictionary. It is quite nature for any compiler of dictionary to consult and refer the previous such similar works for bringing perfection. Perhaps, Monier Williams accomplished the goal through this compilation. If one observes the way and method of presentation, no doubt the person would not miss the meticulous planning of the compiler. There remains no word to be added, as the dictionary is comprehensive in its presentation. Having understood the limitation of Sanskrit verbs as listed by Panini and others, Williams brilliantly managed with Kri and Bru to express appropriately all meaning of verbs used in English. Further, one could appreciate the profoundness in Paninian Grammar of the compiler through out the work. The present edition of the dictionary compiled by Monier Williams is unique in many ways. Firstly, the type set is pleasant and readable as the earlier editions were brought out with instant print technique with the two centuries old letter face of 1851, which was difficult to read due to its complex and ambiguous type set and for obsolete font that are no more or hardly recognized. Secondly, the errata of the original edition were continued in subsequent editions due to instant print, but in the present edition, the errors are corrected appropriately. Thirdly, few words, meaning and derivations are added, which are given in side the square brackets  to retain the originality of the earlier compilation. Fourthly, a number of useful words are classified under various heads in the Appendix for ready reference, which are commonly used in general conversation. 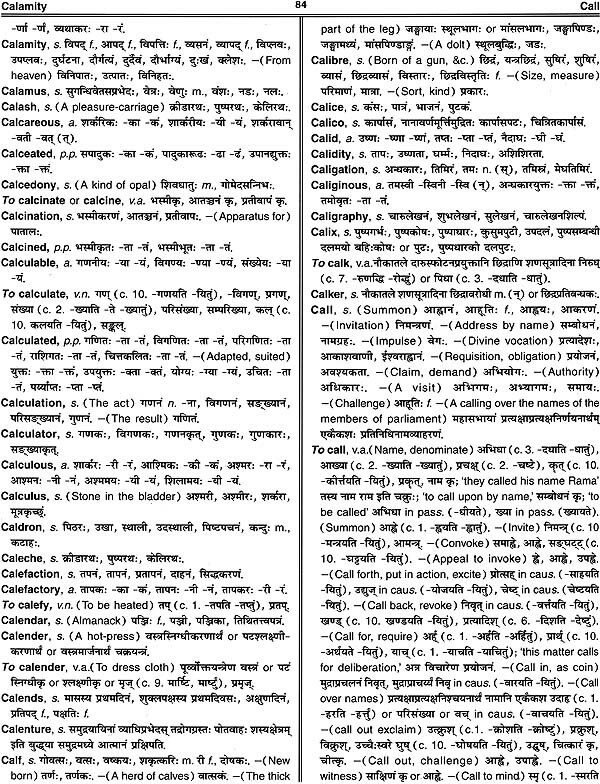 Fifthly, Sanskrit equivalents of the most commonly used Greek/Latin terminology and other European languages are given for operative usage and greater comparison. 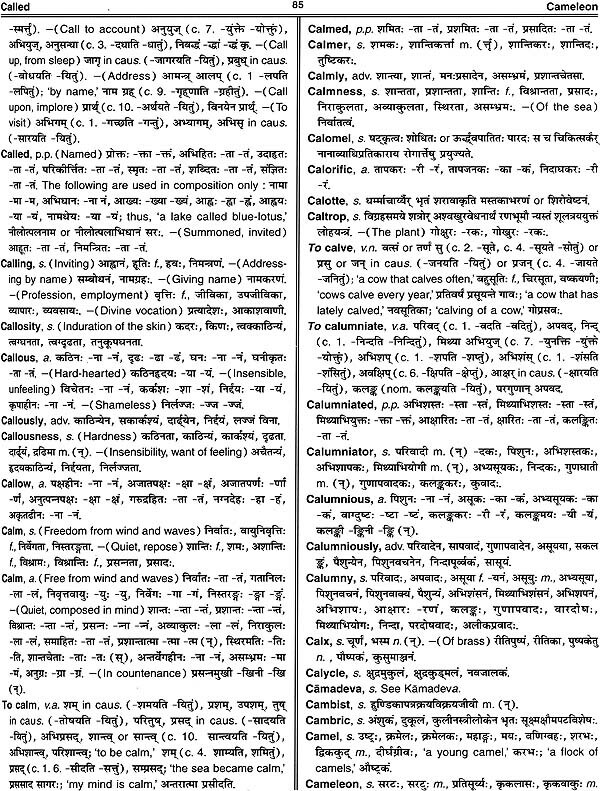 Sixthly, Sanskrit equivalents of selected English words used in Indian Constitution are given alphabetically to enable the readers to get an idea of extensive spectrum of vocabulary. However, as the world is experiencing the unprecedented flow of new words due to knowledge explosion, it is not possible for any compiler to accommodate all the words in its entirety. This dictionary compiled two centuries ago is also not an exemption for this and the reader may experience the need of new words and phrases to meet the information explosion. To retain the originality of the compilation by prefixing or suffixing ancillary words or verbs. In future, Sanskrit academia may take up the responsibility of compilation in an organized manner in line with Oxford Dictionary project from time to time, which would serve the purpose. Though coining or deriving new words with existing roots is one way to solve the flow and on the other hand one should sincerely understand the vast Sanskrit literature and particularly the Ganapatha compiled by Panini which is capable of supplying all the vocabulary demand as an Akshaya Patra. I hope the present edition would be appreciated and welcomed by the scholars, students, and lovers of Sanskrit. I take this opportunity to thank Sri Radhe Shyam Gupta Ji - who always thinks of innovation in his publications keeping in view the common man and ceaselessly tires to take the divine language Sanskrit to the public - for his earnest efforts in bringing out this edition. Roger Ascham, in bearing testimony to the classical proficiency of his illustrious pupils, Edward and Elizabeth, said of them, that they not only understood, but composed in Latin, skilfully and with ease. Such an assertion, made three centuries since by the great preceptor of the age, leads to the inference, that, even in that early period, the value of composition as a criterion of scholarship was duly appreciated. It would be needless to quote the more express statements of scholars and linguists of modern times, in proof of the estimation in which this accomplishment is now held as a test of sound proficiency. It is sufficient to know, that in these days of intellectual progress and competition, no classical examination is considered effectual in which a prominent place is not assigned to composition. Indeed, an increasingly high standard of excellence in this branch of education is now demanded by all collegiate tribunals. 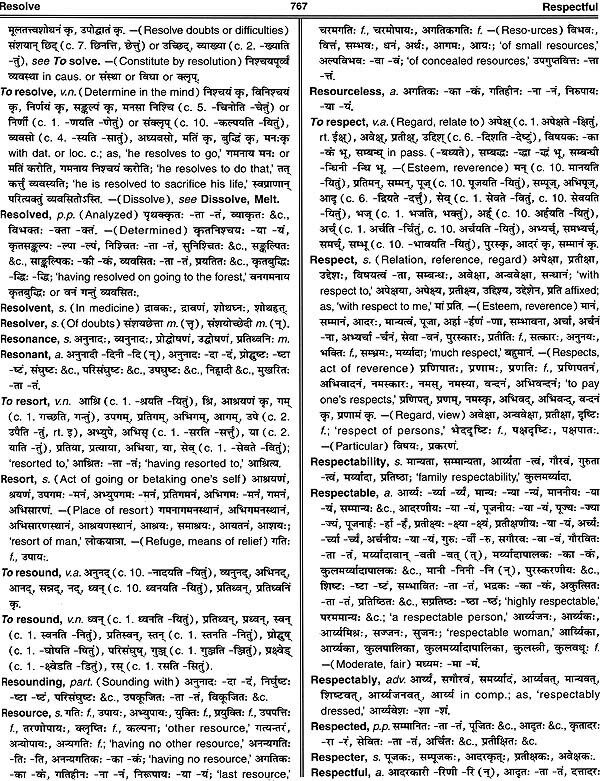 In unison with these opinions, the framers of the Statutes of the East-India College have provided, that no student shall be pronounced qualified for Indian serivce until he can make an intelligible translation from an English passage into the Oriental languages in which he has been instructed. And if this requirement has been wisely made, as a test of scholarship in the spoken dialects, much more has it so been made in regard to Sanskrit, the classical language of India, which bears a far closer relation to those dialects than Greek and Latin bear to the living languages of Eurpoe. If at our Universities and Colleges, where are educated many who are destined to fill the highest offices in our home government, the composition of Latin prose is demanded of all candidates for degrees, with much more reason may Sanskrit composition be made an essential at this Institution, where are trained the whole body of civilians to whom the government of our Indian Empire is to be intrusted. Nevertheless, it must be admitted that a student can hardly be expected to practice composition and translation in a difficult language, if the usual aids are not placed at his disposal. That such aids have not hitherto been made available in Sanskrit has been owing to the great difficulty of compiling a good English and Sanskrit Dictionary. 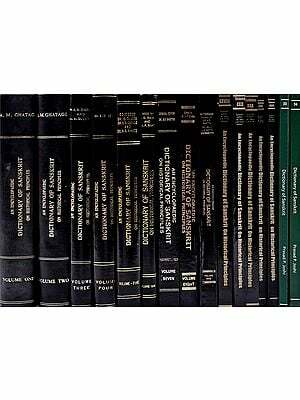 Reverse Dictionaries are sufficiently within the reach of the student of Greek and Latin. In truth, the time that has been spent in investigating these languages, during many centuries, by a succession of learned men, each improving upon the results of his predecessor's labours, has led to the production of such a variety of dictionaries, pharase-books, and vocabularies, that the work of Greek and Latin lexicography, in the present day, has become a mere process of sifting and digesting the mass of existing materials. Yet, even in these languages, so great has been the difficulty of compiling a good Reverse Dictionary, that, after numerous incomplete attempts, it has only been within recent years that any really valuable English-Greek or English-Latin Dictionary has been published. With reference to some of the spoken languages of the East, much has been done to facilitate translation and composition. In Hindustani, it will scarecly be necessary to allude to the labours of that eminent scholar, Dr. Gilchrist, and in more recent times to the works of Mr. Shakespear and Dr. Duncan Forbes. In Bengali, great assistance is afforded to the student by the copious Enqlish-Benqali Dictionary of Ram Comul Sen, in Marathi, still greater, by the admirable English and Marath! Dictionary of Major Candy: in Telugu, by that of Mr. Morris: in Carnataca, or Canarese, by that of Mr. Reeve. In Persian and Arabic, the dictionary of Professor Johnson, now passing through the press, will offer to the student a complete Persian, Arabic, and English Lexicon; but, although Reversed Dictionaries of English and Persian are procurable, a good lexicon in this form remains yet to be complied. The English and Persain Dictionaries, or rather Vocabulaires, of Meninski and Wilkins, are proofs of how little assistance is rendered to the student, in translating European ideas and phrases, by a mere supplementary vocabulary which is a reversed counterpart of the preceding lexicon. In most of the other spoken dialects of India such vocabularies exist, and are, without doubt, useful aids in the absence of more complete works. But in Sanskrit, nothing of this description, deserving of notice, has hitherto been effected. The Sanskrit and English Dictionary of Professor H. H. Wilson is, indeed, too well known as one of the best lexicons in any language to require comment in this place; and if the labours of that eminent Orientalist had been directed to the composition of an English and Sanskrit Dictionary, the student would long since have enjoyed the advantage of an aid to composition, far more effective than that which the present work can supply. Such as it is, however, this Volume appears before the public as the result of the first attempt that has yet been made to meet a want, which the experience of every day renders increasingly felt. For it is not too much to allege, that the great development of the study of Sanskrit, during late years, has caused the absence of a Reverse Dictionary to be recognised as a want by many very different and very important members of the community, both at home and abroad; by students and civilians, by scholars and philologists, by chaplains and missionaries; by all those zealous men who have devoted themselves to the social, religious, and intellectual improvement of the natives of our Indian Empire. With missionaries, and other philanthropists and scholars, whose aim has been to communicate scriptural and scientific truth to the learned natives, through the medium of their classical language, and to the uneducated, through their vernacular tongues, the absence of an aid to composition has doubtless enhanced the difficulties by which their labours have been retarded. It will be sufficient to mention the well-known names of Dr. Carey and Dr. Yates, whose translations of parts of the Bible are valued by all promoters of the cause of Christianity in the East; of Dr. Mill, formerly Principal of Bishop's College at Calcutta, whose history of Christ in Sanksrit dialogue is still more acceptable to the natives of India, from its adaptation to their own' system of teaching; of Mr. John Muir, whose zeal for the welfare of the Hindus has been displayed by carrying out and improving the system of Dr. Mill, in numerous excellent tracts; and lastly, of Dr. James Ballantyne, the energetic Principal of the college at Benares, whose Sanskrit lectures on the elements of general knoweldge, and other scholarlike writings, prove him to be eminently fitted for the post to which he has been appointed. Among philological scholars, whether in Europe or the East, the need of a complete compendium of synonymous words and vocables, in a language which is the key to the solution of every problem in comparative philogogy, is too obvious to require demonstration. 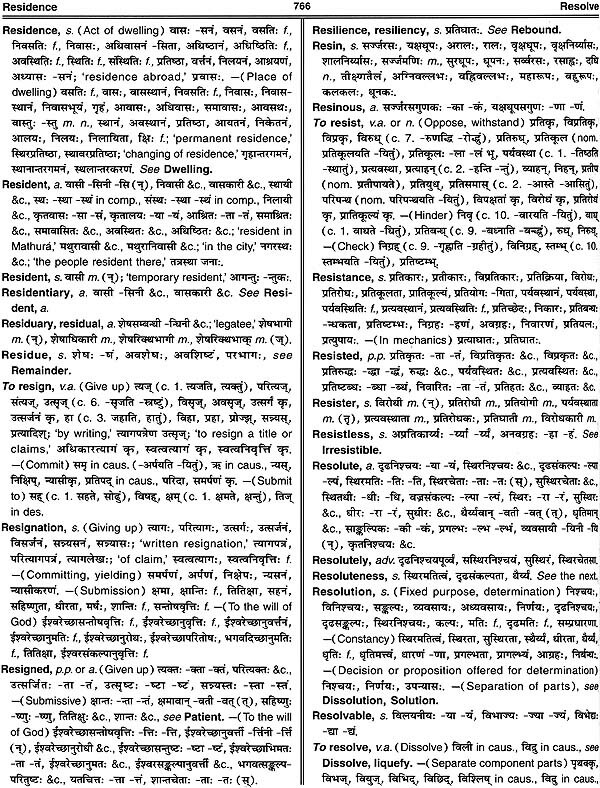 With respect to the civil servants of India, there can be no doubt that the want of a Reverse Sanskrit Dictionary has contributed to render unpopular the study of a language which must force itself, however distastefully, on their observation, by the influence which it exercises on the spoken dialects of India-an influence far greater than that of Latin on English, Italian, or French. But it is by the candidates for the civil serivce who are educated at the East-India College that this want has been chiefly acknowledged. Here it has seriously affected the popularity of a study which, above all others, ought to be cultivated, if on no other grounds, at least on the score of its adapting itself, more than any other, to the condition of students, who, being ignorant of their precise destinaton in India, are undergoing that course of general training which is best suited to fit them for the special requirements of particular localities. Such is the want, then, which the Compiler of this dictionary has attempted to supply. But not even his firm persuasion of its magnitude could have emboldened him to address himself to a task of so much difficulty, had he not been liberally encouraged by the Honourable Directors of the East-India Company, whom he has honour to serve. The public does not require to be informed, that it is the desire of those generous Rulers to win the attachment of their Indian subjects, by furthering every undertaking which aims at improving the knowledge of their languages and literature. A long enumeration might be made of dictionaries, vocabularies, and important publications, which have issued, and are now issuing, from the press, under the patronage of the Honourable Court. The present is but one out of numerous instances in which the authors of long and laborious works have had to record their gratitude for the countenance thus wisely extended. It will not be necessary for the Compiler to dwell on the many difficulties he has had to encounter in pursuing his solitary labours, unassisted by the native Pandits and transcribers, who lighten the toil of the lexicographer in India. Those who understand what it is to be a pioneer in any work of lexicography, to be, as it were, the first to break and clear the ground over an untrodden field of inquiry, will doubtless, in their candour, appreciate at its full value the labour he has undergone in carrying this Volume to its completion. They will also be prepared to expect inequality in the execution, especially of the earlier pages, and many defects and inconsistencies throughout the whole body of the dictionary, agreeably to the inevitable law of expansion and improvement to which such a work must be subject in its progress through the press. No apology need, therefore, be made for these imperfections. But a brief account of the method in which, during nearly eight years, the Compiler has prosecuted his labours would seem to be expected of him, and is, in fact, rendered necessary by the entire novelty of his work. 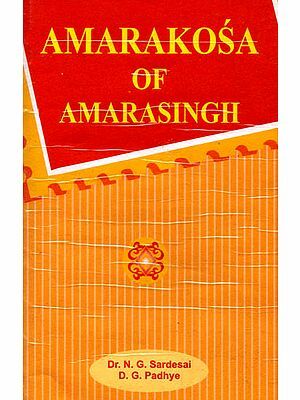 He commenced by transcribing carefully, and then arranging in alphabetical order, all the English words, with their Sanskrit synonyms, contained in the Kosha of Amara Sinha, edited by the late Mr. Colebrooke. His next step was, to have copied, on nearly two thousand pages of large folio paper, with suitable intervals, all the English words in Riddle's English-Latin Dictionary, known to be very useful in Latin composition. Having thus prepared a kind of thesaurus, or repository for the collection of words and phrases, he proceeded to insert therein, in their proper places, all the words of the Amara Kosha, above referred to, as well as all those contained in the Hitopadesa, the Selections from the Mahabharata, edited by Professor Johnson, the Meghaduta, the Anthology of Professor Lassen. and all the roots, with some of the examples, comprised in that most learned and admirable compilation, the Radices Linguae Sanskritae of Professor Westergaard. 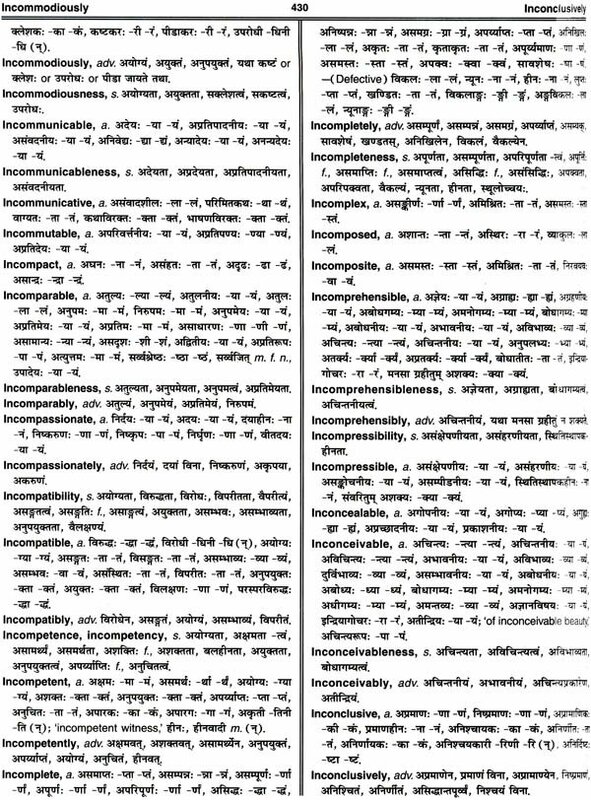 A sound and solid foundation of useful household words being thus laid, the Compiler commenced reversing the second edition of Professor Wilson's Sanskrit and English Dictionary, incorporating in his thesaurus all the new words as they occurred, and omitting only those which represented ideas or things having no approximate equivalent in English. This was a process of much time and labour, requiring a very attentive perusal of the dictionary, accompanied by much transcribing, collating, arranging, and inserting of words and phrases. It might be hastily inferred, that having accomplished thus much, considerable advance had been made towards the completion of the work; and if the object of the Compiler had been to compose a good vocabulary, reversing the senses of the words in the Sanskrit and English Dictionary, and nothing more, such would have been the case. But a complete dictionary, which was intended to offer an effectual help to the student in practising translation, was not merely to be compiled by collecting words and reversing meanings. It was to be continuously composed with a thoughtful consideration of the best Sanskrit equivalents for modern expressions and idioms, and a careful disposition, under each English word, of its several equivalents, in their proper order, and in their proper connection with its several shades of meaning. In fact, the real business of writing the Dictionary had now to be commenced. 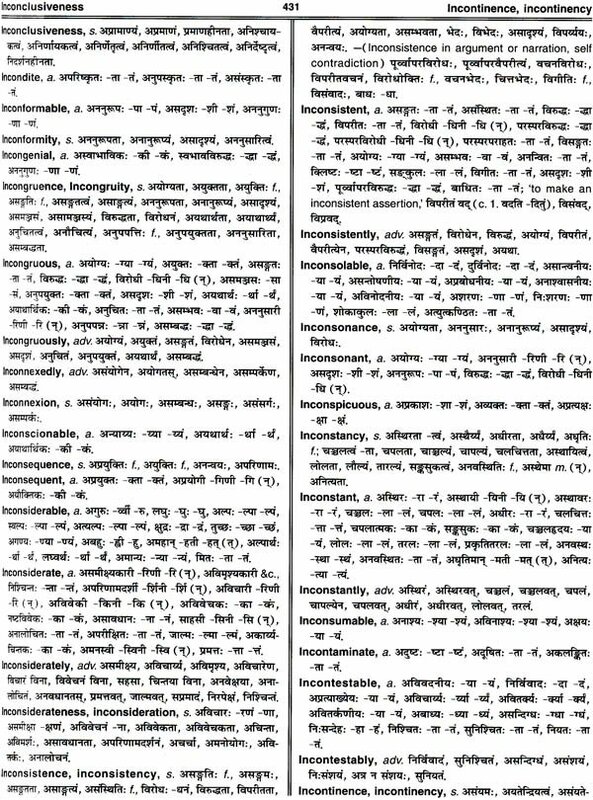 Having procured the latest edition of Webster's English Dictionary, in which are contained all the words of Tod's edition of Dr. Johnson, with many modern additions, as well as all the participles and adverbs, the Author proceeded to translate it systematically into Sanskrit, either gathering his materials from his own collection of classical words, or assisting his memory by suggestions from the Bengali Lexicon of Ram Comul Sen, and omitting only those expressions which seemed obsolete or obsolescent, or of which no classical equivalent could be found or suggested. Having thus progressed as far as the letter C, and the exigency of the case seeming to require the speedy appearance of the work, even at the risk of incompleteness, the printing of it was commenced, the Compiler feeling confident that, by great diligence, he might keep in advance of the press. It was not till some progress had been made that the inexpediency of this step was manifested by various omissions, which, though overlooked in the manuscript, became gradually apparent in the printed pages of the work. As soon as this discovery was made, one of two courses remained to be pursued, either to cancel the earlier pages of the work, or to supply their deficiencies by an Appendix. The latter of these courses was adopted, and the process of printing was first suspended, and then retarded, until, by a more extensive course of reading and research, the stock of classical materials was enlarged. To effect this, the Compiler undertook a second and more minute perusal of Professor Wilson's Sanskrit and English Dictionary, and noted numerous words and terms which had before escaped his observation. He also reversed the Sanskirt part of the excellent English and Marathi Dictionary of Captain Molesworth, collecting from this source many valuable words, and much useful information. He then read through the Code of Manu, and the Commentary of Kulluka Bhatta, with the view of obtaining therefrom a store of choice phrases and idioms. And lastly, he studied attentively, with the same object, the plays of Kalidasa, and parts of the Raghuvansa, Ramayana, Mahabharata, and Bhatti Kavya, He moreover extracted some good words from the Glossarium Sanskritum of Professor Bopp, and made extracts also from some modern Sanskrit writings and translations of the Scriptures. Without detracting from the acknowledged merit of these translations, he believes that little value is to be accorded to suggestions adopted from a source which is not classical. But he avails himself of this opportunity of gratefully acknowledging his obligation to his friend and colleague, Professor Johnson, for furnishing him with a list of words, collected by him in the course of his reading, chiefly from the following standard classical works:--The text of Manu, with the Commentary of Kulluka; the two law-treatises of Jimutavahana, called Dayabhaqa and Mitakshara; the Vikrarnorvaslya, Sakuntala, Mrichchhakatika, Malatimadhava, Mudrarakshasa, Ratnavali, Uttararamscharita, and the Rajataranqini, published by Capt. Troyer. Having enriched his store of materials with words and phrases from these approved sources, the composition and printing of his Dictionary was gradually advanced to the end of the latter H. At this point a copy of Major Candy's English and Marathi Dictionary came first to hand. Had an impression of this work been received earlier, it would have saved the Compiler the time and labour consumed by him in reversing Captain Molesworth's Marathi and English Dictionary, a task which he had not completed, until three hundred pages of his own work had been printed off, and excluded from any improvement derivable from this source. It is, however, right to acknowledge, that the Dictionary of Major Candy, although it often furnished little more than a repetition of what the Compiler had himself collected, either from the Sanskrit or Marathi Lexicons, provided him with numerous additional words, and much useful information, upon Hindu mythology and science, the value of which cannot be too highly estimated. Indeed, it would be difficult to make mention of Major Candy's work excepting in the highest terms of praise. By these aids, and with the addition of some happy renderings of scientific terms from Dr. Ballantyne's Lectures, and of some classical words from the Appendix to the late Dr. Yates' abridgment of Professor Wilson's Sanskrit Dictionary, the remainder of the present work, from the letter I to the end, was composed and printed in a comparatively short period. The foregoing statement is the best apology for any want of uniformity discoverable in the plan of this volume. A general uniformity, sufficient, it is hoped, for all the purposes of reference, has been sustained throughout. But perfect unity is hard to be maintained, at least in the first edition of a laborious work, compiled by gradual accretion from an increasing store of materials, and liable in its growth to occasional improvement and expansion.